That you can't admit a mistake and apologize for jumping to conclusions AND down my throat is sad and disappointing. You strike me as better than that in all ways. Nothing wrong with a little humor... but your little tirade was uncalled for. NOT a leap of faith, NOT we said / they said... but real proof. NOT saying it hadn't been done, I just had not seen it. If you truly believe I have nothing to contribute, fine. Come at with with a reasonable rebuttal... I've been wrong in mytheories many times before and will continue to be wrong..
That's why theories are put to a test before they can be accepted as representative of a solution... no? Last edited by David Josephs; 03-10-2013 at 01:59 AM. enough to determine a match or not? And it was Roscoe who could easily have added a backyard photo or film negatives to the evidence collected by the Dallas Police on the afternoon of November 22. 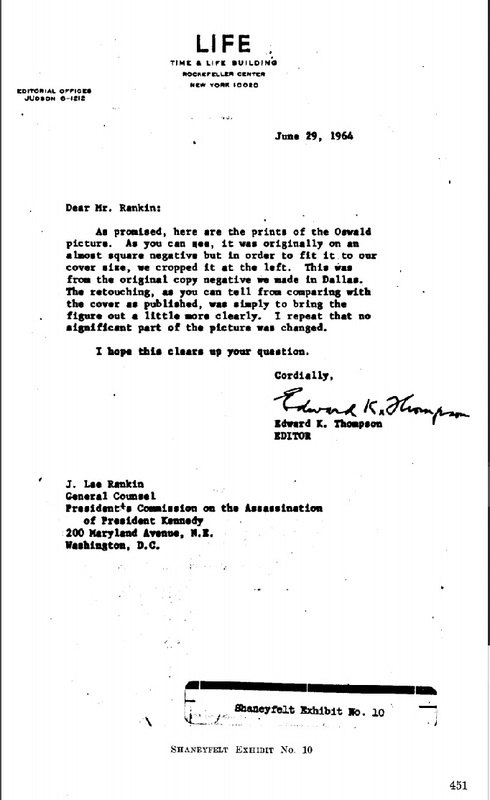 And Roscoe may have been the unknown police officer who gave the photo to Life Magazine. After Roscoe's death, his wife found another backyard photo among his possessions. And in 1991 the Dallas Police found additional backyard photos in their files. These photos are another "smoking gun" and were created for the purpose of placing a rifle in Oswald's hands. 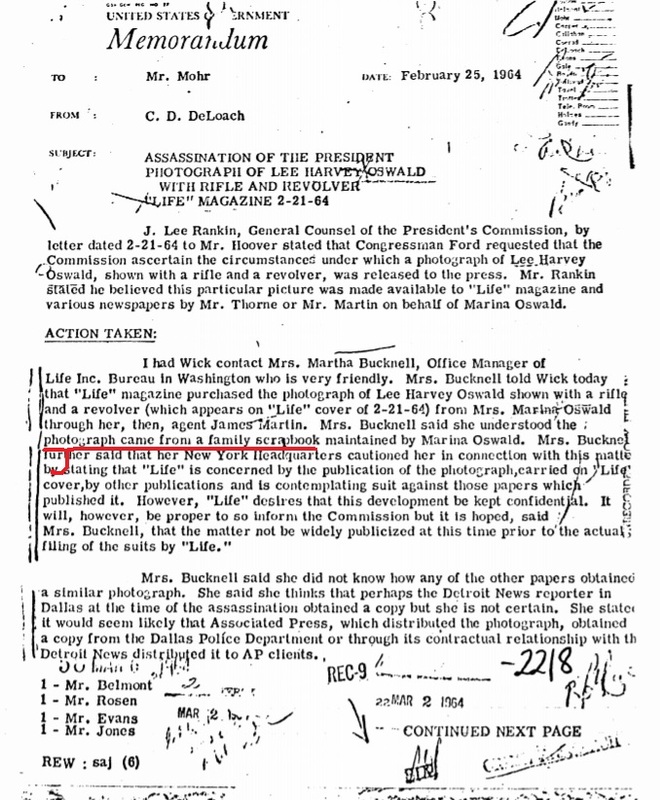 They are further proof that Oswald was being set up as the "patsy" prior to the assassination. ...Martin told the commission Marina seemed to believe her husband alone killed Kennedy. ...While it lasted, being Marina's business manager was a unique experience, Martin said. He said he sold the photo of Oswald holding a rifle to Life Magazine for $5,000. He said the photo "came directly from her scrapbook" and could not have been altered after the assassination, as some conspiracy theorists allege. Peter Janney's uncle was Frank Pace, chairman of General Dynamics who enlisted law partners Roswell Gilpatric and Luce's brother-in-law, Maurice "Tex" Moore, in a trade of 16 percent of Gen. Dyn. stock in exchange for Henry Crown and his Material Service Corp. of Chicago, headed by Byfield's Sherman Hotel group's Pat Hoy. The Crown family and partner Conrad Hilton next benefitted from TFX, at the time, the most costly military contract award in the history of the world. Obama was sponsored by the Crowns and Pritzkers. So was Albert Jenner Peter Janney has preferred to write of an imaginary CIA assassination of his surrogate mother, Mary Meyer, but not a word about his Uncle Frank.